"Sitting is the new smoking," according Runner's World magazine. Recent studies show that sitting for more than 6 hours a day increases mortality rates for women by 34%, regardless of how much physical activity you engage in otherwise. What do you do if your job requires you to work at a desk all day? You may have heard of the standing desk, but what about a treadmill desk? One NY Times reporter burned 300 calories before lunch by walking at a pace of 1 mile/hr! 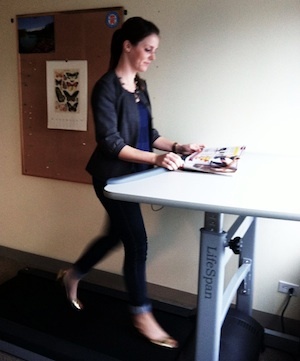 Emily Leaman of BeWellPhilly demonstrates the treadmill desk. Can fat hurt your brain? New studies conducted at Georgia Regents University in Augusta show that excess fat in animals causes a marked decline in cognitive function. It was previously thought that the brain was immune to the negative effects of fat because of the blood-brain barrier - a protective sheath that blocks many harmful molecules from entering the brain. But, this new study shows that obesity weakens this protective barrier and allows the harmful substances released by the fat cells to enter the brain. The bright side is these same animals reversed their cognitive decline with regular exercise. Another great reason to get out there and move your body!